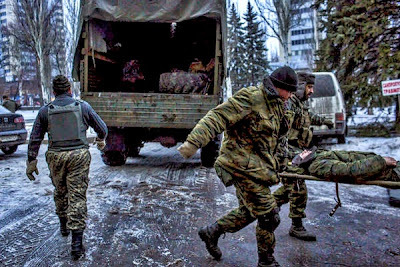 DONETSK, Ukraine -- Unexpectedly, at the height of the Ukrainian winter, war has exploded anew on a half-dozen battered fronts across eastern Ukraine, accompanied by increasing evidence that Russian troops and Russian equipment have been pouring into the region again. Rebel fighters unloaded the body of a dead comrade at Vishnevskogo Hospital in Donetsk, Ukraine. A shaky cease-fire has all but vanished, with rebel leaders vowing fresh attacks. Civilians are being hit by deadly mortars at bus stops. Tanks are rumbling down snowy roads in rebel-held areas with soldiers in unmarked green uniforms sitting on their turrets, waving at bystanders — a disquieting echo of the “little green men” whose appearance in Crimea opened this stubborn conflict in the spring. The renewed fighting has dashed any hopes of reinvigorating a cease-fire signed in September and honored more in name than in fact since then. It has also put to rest the notion that Russia’s president, Vladimir V. Putin, would be so staggered by the twin blows of Western sanctions and a collapse in oil prices that he would forsake the separatists in order to foster better relations with the West. Instead, blaming the upsurge in violence on the Ukrainians and the rise in civilian deaths on “those who issue such criminal orders,” as he did on Friday in Moscow, Putin is apparently doubling down, rather than backing down, in a conflict that is now the bloodiest in Europe since the Balkan wars. With the appearance in recent weeks of what NATO calls sophisticated Russian weapons systems, newly emboldened separatist leaders have abandoned all talk of a cease-fire. One of the top leaders of the Russian-backed rebels said Friday that his soldiers were “on the offensive” in several sectors, capitalizing on their capture of the Donetsk airport the day before. “We will attack” until the Ukrainian Army is driven from the border of the Donetsk region, Aleksandr Zakharchenko, leader of the Donetsk People’s Republic rebel group, said in comments carried by Russian news agencies. “On our side, we won’t make an effort to talk about a cease-fire,” Zakharchenko said. For long-suffering residents of Donetsk, who have lived with constant shelling, chronic electricity failures and, since September, a cutoff of pensions and other government support payments from Kiev, the resumption of military action came as little surprise. “It was pure illusion that peace could be achieved now,” said Enrique Menendez, a former advertising agency owner who now runs a humanitarian relief operation in eastern Ukraine. While the separatist forces now seem ascendant, analysts have little doubt that their fortunes are tied to the level of support provided by Moscow. In August, on the verge of defeat, they were rescued by an all-out Russian incursion that turned the tide on the battlefield and drove Kiev to the bargaining table. The same dynamics appear to be at work now, Ukraine and NATO say, with Russian troops in unmarked uniforms apparently joining the separatists in the assaults on Ukrainian positions. While Moscow denies any role in the fighting, Sergei A. Markov, a political analyst close to the Kremlin, says it is not surprising that Putin has continued to support the rebellious republics of southeast Ukraine even in the face of economic pressure from the West. In fact, the intensity of the standoff, he said, has undermined the influence of Putin’s liberal economic advisers in government, rendering their voices almost mute in debates over Ukraine. Konstantin Sonin, a professor at the Higher School of Economics in Moscow, echoed that point. “The influence of economists as a whole has completely vanished,” Mr. Sonin said of the Kremlin. Putin is said to watch his approval ratings closely, and they have risen to great heights recently with the annexation of Crimea and the tensions with the West over eastern Ukraine. In this respect, said Igor Shuvalov, a first deputy prime minister of Russia, continued fighting in Ukraine may actually help to solidify Putin politically at a time of deteriorating economic conditions. “When a Russian feels any foreign pressure, he will never give up his leader,” Shuvalov said Friday at the World Economic Forum in Davos, Switzerland. Nevertheless, Markov said, the stresses of juggling a war and the deepening economic crisis in Russia have left Putin noticeably preoccupied. “We have much less time than before,” he said of a recent meeting between experts and Putin in which he participated. The slow grind of combat in southeastern Ukraine that began in April has now killed at least 5,086 soldiers and civilians, the United Nations reported on Friday. The world body bases its estimate on official morgue and hospital reports, and analysts believe that it understates the total death toll. The report said that 262 of the deaths occurred in the past nine days, making that period the deadliest since the September cease-fire. Signs of the new belligerence were evident across eastern Ukraine on Friday. Indeed, fighting has also flared beyond Donetsk, including a road and rail hub northeast of the city, as well as a strategic checkpoint near Luhansk, the other main rebel stronghold. Rebel commanders claimed on Friday to have captured the village of Krasny Partizan, north of Donetsk, which would be another setback for government forces. In another worrisome sign, the rebels were not the only ones taking a more aggressive tone. Speaking to security officials in Kiev after the loss of Donetsk airport, President Petro O. Poroshenko of Ukraine expressed frustration with the broken peace process. “If the enemy does not want to abide by the cease-fire, if the enemy doesn’t want to stop the suffering of innocent people in Ukrainian villages and towns, we will give it to them in the teeth,” he said. Any major offensive by either side would clearly be a repudiation of the cease-fire signed on Sept. 5 and endorsed by the group’s main sponsor, Russia. That agreement, always shaky, began to break down several weeks ago. It had set the de facto borders of the rebel republic to encompass about one-third of the Donetsk region of Ukraine. Zakharchenko has threatened to expand his territory before, but his warnings have not typically prompted much alarm. Now, with the war raging and his troops on the march, more attention is being paid. As recently as a few weeks ago, peace seemed to be slowly seeping into the blood-soaked fields of eastern Ukraine. Russia seemed occupied with the drop in oil prices and the ruble’s collapse. The shaky cease-fire was holding. Language on both sides was noticeably more conciliatory. That all seems a long time ago now on the war-rattled streets of Donetsk, where a main hospital was hit by a shell this week. If one were to ask the remaining residents of Donetsk, even those who have been loyal to the Kiev government, whether they supported this new rebel advance, they would say yes, Mr. Menendez said — and not necessarily for political reasons.